After two and a half months of traveling abroad, it felt enormously good to come back to the U.S. mainland and to Buster. Much as we love to travel we are also, perhaps paradoxically, homebodies. So taking our home with us as we go, as we do with the bus, has been a perfect arrangement for us and we were thrilled to return to it. 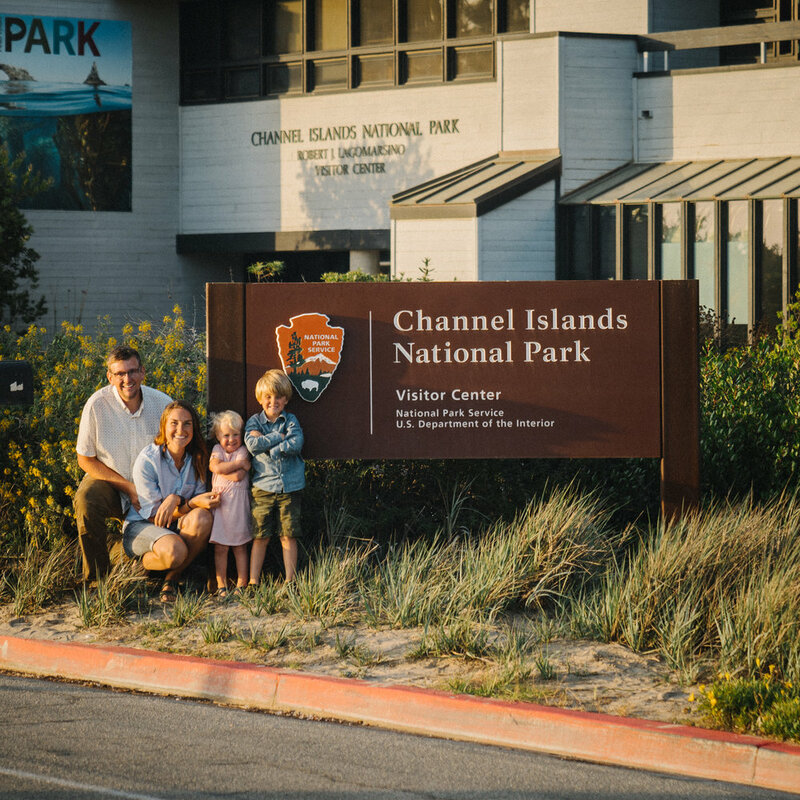 As it happened, though, our first stop after coming home was Channel Islands, so we had to leave Buster a little longer while we ferried out to visit this national park. The park protects five islands off the coast of southern California and has an incredible history: never connected to the mainland, the plants and animal species that swam, flew, floated or drifted to this isolated archipelago adapted over time to thrive in their unique environment. Some species, like mammoths and foxes, shrank so as to require fewer resources. Other species, including mice, scrub jays and certain plants, grew giant compared to their mainland counterparts with more natural predators. There are more endemic species on the Channel Islands than on the Galapagos—indeed, the islands are often referred to as America’s Galapagos, though maybe there’s an argument for calling the Galapagos Ecuador’s Channel Islands ;). People lived here too: 13,000-year-old remains—the oldest in North America—have been found on the islands (and here’s a delightful thought: people and pygmy mammoths overlapped by about a thousands years, and while no one knows for sure if the mammoths were domesticated, the idea of having a tiny little horse-sized wooly mammoth to ride around the island makes me very happy.) These ancient people may have been the ancestors of the Chumash Indians, who later made the islands home. In the past 200 years, ranchers took over the Channel Islands, bringing in sheep and cattle that grazed the native plants down to their roots, pigs that dug up those roots, and invasive plants that took over where endemic species were killed off. The national park was established in 1980 and has been working to return the islands to their natural state, but ranching continued in some places up til 1998. The ecology still looks very different from the way it would have before ranching, but the islands are still home to thriving communities of living things, including 145 species found nowhere else on Earth. The national park also protects the ocean around the islands, where the world’s largest kelp forest grows and marine life thrives. Crossing the Santa Barbara Channel on our way to Santa Cruz, we saw pods of dolphins and sea lions and flocks of brown pelicans and cormorants. Twenty-eight different species of dolphins and whales ply these waters, and tens of thousands of elephant seals and sea lions use the islands’ beaches. Each of the islands has its own characteristics: we chose to spend our time camping on Santa Cruz Island and doing a day trip to Santa Rosa Island. The week before our arrival on Santa Cruz, we took 5 flights of 5+ hours and crossed 7 time zones, so we were more than a little wiped. On our first day, we arrived at Scorpion Ranch on Santa Cruz and joined a guided hike up to Cavern Point. On the way, we saw huge blue scrub jays and cat-sized island foxes, and learned about Chumash life and ranching on the island. Afterward, we headed back to set up camp and do what we’d end up spending a lot of our Santa Cruz time doing: hanging out, playing games and napping. Our site was perfect: set away from most of the other campers, nestled in the hills and shaded by huge eucalyptus trees with plenty of sticks and bark for the kids to play and build with. Late in the afternoon, we peeled ourselves away from camp to hike up to Potato Harbor, where we watched the sun set over the sea cliffs and then hiked back in the dwindling dusk. Santa Cruz has a high concentration of sea caves, including some of the world’s largest, and these are best explored by water. So we knew we wanted to do some kayaking while we were there, but our inflatable kayak doesn’t do well on the ocean so we opted instead to take a guided tour with Island Kayaking. Both kids were too young to join so we took turns; David went one day and then I went the next. Our tours were a bit different from each other—David did more caves, I did a mix of caves and intertidal zone—but we both had a fantastic time and learned loads about the island from our guides. In the between-times, we explored the trail to Smuggler’s Cove, played at the beach, watched gliding pelicans and diving cormorants—it was an all-out decompression session, relaxing to the core, and we loved it. After three days on the island, we caught the ferry back to Ventura; on the way, we passed right through a super-pod of dolphins: they cruised and leapt around our boat, and in the course of five minutes, we saw thousands. It was indescribably magical. If there’s anything that makes you feel like the world is going to be okay, being in the water alongside of bunch of dolphins is surely it. We wanted to experience one more island before we moved on up the California coast; Santa Rosa was our pick. Rosa is one of the outer islands so it takes bit longer to get to (2.5 to 3 hours vs. Santa Cruz’s 1 hour), but spending more time on the water meant we got to take in the whole of Santa Cruz’s coast on the way: we circled the south end of the island on the way to Rosa and the north and west ends on our way back. Because of the ferry schedule, we couldn’t camp on Rosa—but it’s hard to be disappointed by a day trip that covers such a scenic route. Santa Rosa is the second-biggest of the Channel Islands (behind Santa Cruz), and its coastline is more white sand beaches than craggy sea caves. We arrived at the island, walked through the remains of the Vail and Vickers Ranch, and headed to Cherry Canyon. The trail led us through the rocky, wildflower-lined canyon and up into the grassy hills, where we could look down on a grove of rare Torrey Pines and bright blue Betchers Bay. Then we headed down on to the beach for a picnic and dune jumping. The striated erosions on the coastal rock made a gorgeous backdrop to playing in the sand. On the way back to the mainland from Santa Rosa, we cruised close to the Cruz coast, checking out the caves and beach-basking sea lions. Our favorite part was Painted Cave—one of the largest sea caves in the world, with clear, fish-filled water and multi-hued rock, it was big enough for our whole ferry to fit in. We glided slowly into the belly of the enormous cave, then chugged our way back out, and even on a big boat with loads of people, it was a quiet and awe-inspiring experience. It’s hard to get a taste of what California used to be like, especially in the southern part of the state. Channel Islands is about as close to time travel as you can get in this area. The inland landscape looks almost like the Midwest; closer to the ocean, you’re surrounded by seals and sea birds, cliffs and kelp; and the plant and animal life is literally like nowhere else on Earth. We loved this little park and will be dreaming about our paddle here forever! I thought the same thing about the pygmy mammoths! Hahaha. Man. I love this place. And I’m so glad you guys got to stay in the dreamiest campsite ever – I daydream about that site on the reg. I had never heard of this place until you posted about it. My in-laws live in the Bay Area- I am so excited to hopefully visit the island next time we visit my in-laws! What incredible pictures! !